Oh summit where art thou? Park on the roadside at S112 083 A (Point A) on the Mellary to Newcastle road just after you cross the border to Tipperary and an abandoned farmhouse. There is room here for 5-6 cars. You will notice there are two tracks running side by side uphill , take the right hand one and follow it uphill and west. After 0.75 kms follow this track left and around the side of Knockmeal for about 1km. 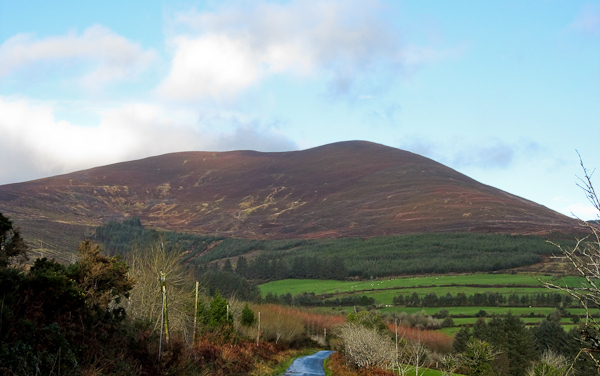 The track turns left again and slightly downhill to the col with Knocknafallia. You will see a rough heather covered low bank, which I recommend walking to the east side of, skirting Knocknafallia and heading gently uphill towards Knocknagnauv. Follow this bank and though it disappears into the bog on some small sections eventually it becomes quite clear and the stonework appears.After you cross a very boggy,moss covered stream bed the heather will start to thin and you will notice a rough track heading uphill and south west. Follow this for a short distance until it levels out.